Ideally your home heating system will work properly whenever you need it to. When something does go wrong though, Millie’s Heating & Air Conditioning has just the combination of skills and expertise you are looking for. Our technicians can work on any and all types of heating systems, and we will do whatever we can to get your system fixed quickly and the heat back on in your home. Before you can call us for Ashburn heating repair services, you need to know that there is something wrong that needs repairing. Signs of trouble in your heating system include inadequate or uneven heating in all or part of your home, an unexplained increase in your heating bill and anything leaking from any part of your home heating system. When you do notice something like this, it is important that you call for Great Falls professional heating repairs as soon as possible. If you put off repairs because the problem does not seem that bad, it will only cost you more money and aggravation in the long run. That is because a heating system that is not working properly most likely is not running at optimal energy efficiency either. So even if your system is still keeping your home comfortable, it is using more energy than necessary to do it. These types of problems with your heating system also will not go away on their own. Since you are going to have to pay for repairs sooner or later, it is best to do it sooner to keep the repair job as small as possible. Waiting until the problem becomes more severe almost guarantees more of your heating system has been affected by the problem and that repairs will be more extensive and expensive. Whether you have a new furnace, an older heat pump or anything in between, our technicians can repair it. They are always up to date on the latest developments in the field, and we make sure they have access to the best diagnostic tools and equipment. Even if we did not install your heating system initially, we are always available for emergency repairs, large or small. 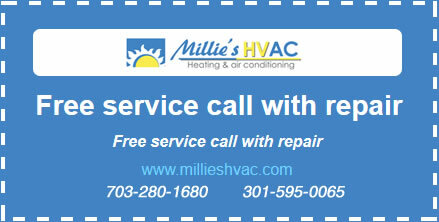 No matter what type of problem you notice with your heating system, do not hesitate to call Millie’s right away. Our technicians will be out as quickly as possible to determine the source of the problem and make the necessary repairs. With our Arlington heating repair services, you can be confident that the repairs we complete are done with only the highest quality parts and tools. And that means they will keep your heating system running properly over the long haul.